Many people are intimidated by the idea of roasting a whole bird – this kind of practice is often only reserved for a Thanksgiving turkey, and tragically so. I like to consider the whole roasting and carving of a chicken as practice for a perfect holiday meal. 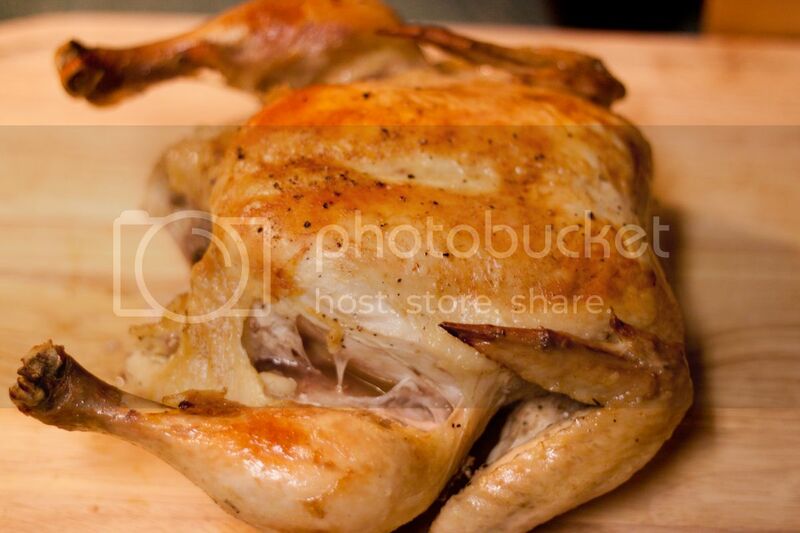 There are dozens of ways to roast a chicken, and many more ingredients you can use to add complexity, but I feel that they are ultimately unnecessary. Mine is a two-part process, which includes initially cooking the chicken breast-side down to prevent them from drying out. Pre-heat the oven to 400 degrees. Rinse and pat dry the chicken with paper towels. Stuff the chicken with the garlic cloves, bay leaves, rosemary, and thyme (and lemon if you’re using it). Place the chicken breast-side down into the french oven, and pour the chicken broth around the chicken (and the veggies if you’re using them). Cover the french oven, place it in the middle of the oven and bake for 45 minutes. While it is baking, set the butter out to soften (on top of the oven to speed the softening up). When the butter is soft, stir it together with salt and pepper and set it aside. 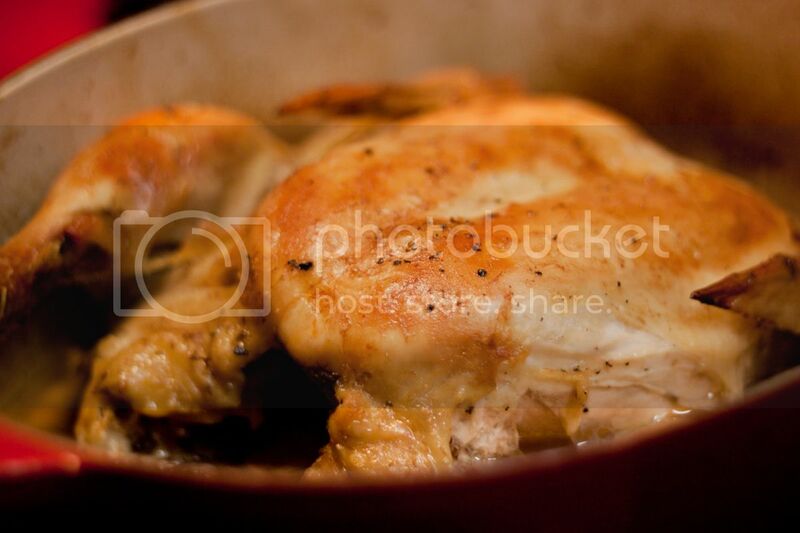 Take the chicken out of the oven and turn the temperature down to 375 degrees. Flip the chicken so that it is breast-side up and spread half of the butter/salt/pepper over the breasts and legs. Return it to the oven, uncovered, for 30 more minutes. At the 30-minute mark, spread the rest of the butter/salt/pepper over the chicken and return to the oven for another 20 minutes. Poke the inside of the leg and the part of the breast that touches the leg with a fork – if the liquid that comes out is clear, the chicken is ready. If it is still pink, put it back in the oven and check it every ten minutes. Once the chicken is ready, set it on a cutting board for ten minutes to let it rest before carving. Carefully pour out most of the liquid in the bottom of the french oven and set it aside (that’s your gravy base), but leave the veggies in the french oven in order to make broth later.